This entry was posted on March 20, 2017 by admin. Shrink wrap is far more durable than other forms of packaging. Manufactured from high-quality materials it is strong and difficult to damage. This ensures that any products wrapped in the film are well protected. It is popular for protecting items that get transported long distances such as cardboard boxes. Transportation journeys can be rough going particularly if travelling by sea or air. Weather conditions can cause the transport to move around more than usual causing items to move around more. Products that need protection come in all sorts of shapes and sizes. Some will also be more fragile than others and will need to be better protected. Shrink wrap is so versatile it gets used on items of various shapes, sizes and fragilities. Almost any item can be packaged with shrink wrap for sealing and keeping it safe. It will protect against many factors including dirt, moisture and breakages. This is due to its tight fitting that holds items in place. One of the most desirable features of shrink wrap is that it is extremely cost effective. It is also a space saving form of packaging due to it wrapping tightly around products. This means that it does not take a great deal of space up in warehouses and factories. 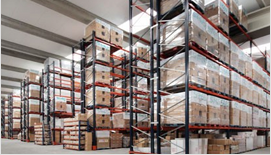 As well as saving space in warehouses and factories it also saves space during transportation. This means that more items can be shipped at once.